Dave Danhi is the founder, director, and executive chef of The Grilled Cheese Truck. This was the first gourmet food truck to go national and there are big plans to expand through a novel franchising program. A novel program is in the works to sell franchises to returning veterans and it’s a turnkey concept that’s already been tested with great success. A huge following on social media was the initial key to getting this business going. The Big Cheese himself joins us to recount this unlikely success story. Before some health concerns turned Dave in another direction a few years ago he was a sought-after executive chef. In a couple of different stints Dave was the Corporate Executive Chef for Kings Seafood Co. of Water Grill fame. He also was the menu-maker for the (now departed) Georgia on Melrose Avenue. Dave is the 4th owner of DD Factor which was started by Mimi Factor back in 1959. When Dave was at King’s he used their services to recruit needed culinary talent. All of his recruiters have extensive experience in the hospitality industry. Jeff Houck is the respected and provocative restaurant writer for the Tampa Tribune. He’s been writing for them since 2005. For the last four years Keith Roberts has been the busy executive chef of the 342-room Loews Santa Monica Beach Hotel in Santa Monica. He oversees a demanding $10 million culinary operation at the luxury beachfront hotel including banquets, weddings and special events, room service, and the hotel’s signature ocean view restaurant, Ocean & Vine. Chef Keith will talk about his new menu and take us behind-the-scenes to better understand how he satisfies highly discriminating guests on a daily basis at a very busy operation. He also makes the time to mentor students who are part of the Careers through Culinary Arts Program. The always engaging Fifi Chao, a professional food, wine, and travel journalist, and cooking instructor has been profiling Orange County restaurants for The Orange County Business Journal since 1990. If she doesn’t have something positive to say about a restaurant she simply doesn’t write about it. She also is the publisher of Chao’s Dinesty, a private subscription restaurant, wine and travel newsletter. Related to this she hosts special evenings (with her husband, Patrick, a veteran of the hospitality industry) at local restaurants of distinction. It’s a great way to sample a restaurant you might not be familiar with at their very best guided by gracious hosts who treat their guests like extended family! In October Fifi and Patrick are escorting a small group on a exclusive VIP excursion to China. Along the way the fortunate participants will have private access to a hidden part of the Forbidden City in Beijing. Tour guests will walk the Great Wall, visit Xian and the Terra Cotta Warriors museum, go to the city of Wuxi via high-speed train, sail the Yangtze for three days on a brand-new ship, and experience the allure of Patrick’s hometown of Shanghai. Fabulously wealthy people typically have private chefs as part of their regular household staff. At the highest levels these trusted chefs travel around with their employers to their various residences around the country and frequently across the globe. 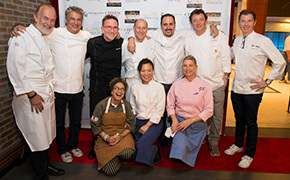 Chef Lorin Adolph is part of this rarified, elite group. His multi-millionaire client lives primarily in Chicago but also has an estate in Malibu. Chef Lorin joins us this morning to discuss his most unusual occupation and where you source the very best ingredients in the world for the pickiest of diners! Our favorite “Ask a Mexican”, Gustavo Arellano, of Taco USA – How Mexican Food Conquered America fame and OC Weekly is no stranger to the show. Discovering worthy hole-in-the-wall eating spots are his daily joy. This morning tacos are on his mind. We’ll get the 411 on their history and origins in Mexico and their tasty regional variations. By the way Taco USA is newly released in paperback. 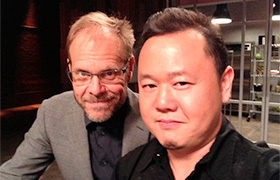 Show 26, April 27, 2013: Wing Lam, co-founder of Wahoo’s Fish Taco and Michael Cho, esq. of Palmieri, Tyler, Weiner, Wilhelm & Waldron LLP. Wing’s colleague and long-time friend, Michael C. Cho, esq. joined the discussion. Michael is an attorney with a busy practice in the hospitality industry in Southern California and is an expert in liquor license issues. He’s also a wine aficionado and was part of the festivities at Kosta Browne Wines. He was serving Wahoo’s fish tacos alongside Wing to the hungry and appreciative guests. Mike shared the story of the founding of Wahoo’s by Wing and his brothers Ed and Mingo. Their father owned the iconic Shanghai Pine Garden Chinese Restaurant on Balboa Island where they worked when they were in high school. John Wayne was a regular. When Wing rejoined the discussion he talked about the upcoming OC Wahoo’s 5K this Sunday, May 5th at the OC Fair & Events Center. It’s part of the OC Marathon and Half Marathon Day Experience. Wing will sound off the gun at the race’s start. The first 800 finishes will get a free Wahoo’s Fish taco and everyone 21 and over gets a free beer!